A conservatory is a great investment and a cost effective way of expanding the living space in your home without incurring moving costs. Providing a smooth transition from your garden into your home. Imagine relaxing in your conservatory on a wet day, viewing your beautiful landscaped garden with natural sunlight embracing you or a family BBQ with children laughing and enjoying the garden whilst you relax on comfortable sofas. A conservatory can fulfil any purpose that you wish, perhaps a study if you work from home, a dining room, a larger kitchen and dining area or a sun-lounge to enjoy the outside with the comforts of sitting inside. Adding a conservatory not only gives great views but offers natural light into living spaces. The five facet style elegant Victorian conservatory is a popular choice offering warmth and plentiful sunlight. The 5 sided design offers rounded aesthetics, creating the impression of a greater space and features a multi-faceted bay and attractive roof crest. A multi-faceted Victoria style conservatory is a sophisticated design with majestic curves which will add exquisiteness and elegance to any home. 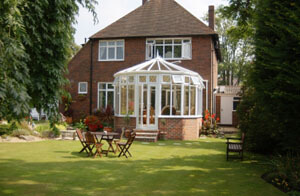 Our range of conservatories come in 5 and 3 facets. There are three popular materials to choose from: PVCU, Hardwood and Aluminium. Long lasting guarantees from a reputable supplier. Modern conservatories are designed and engineered for year round use offering high levels of security, energy efficiency and comfort. Every conservatory supplied by Markwell is custom built and made to measure, we can tailor the design to your specifications. Discuss adding extras such as Pilkington “K” glass (Low E glass) and “Anti Sun” glass to our conservatory designer. Markwell have a wealth of knowledge and experience in supplying and installing conservatories. We will ensure your conservatory is built within a time frame specified and finished with our usual high quality craftsmanship. Markwell is based in Bishops Stortford and covers all Essex and Hertfordshire areas. Customers buy from us with confidence. We have a dedicated designer who will ensure that your conservatory compliments your home perfectly. We pride ourselves on customer satisfaction, our designer will spend time explaining each step of the process from basic design to the final build and will be on hand throughout the process. For details on how we can help, please contact us. We are a specialist glazing company and will manage all aspects of the project, including dealing with any planning or building regulations. Planning permission is not usually required for conservatories.